For more pupil lit I would also thoroughly recommend the appropriately named The Pupil by Caro Fraser (Henry Cecil on Viagra?) the first in her delicious serious about Caper Court Chambers and the gorgeously seductive Leo. Caro’s take on lawyers is that we are all crippled inside as she puts it. 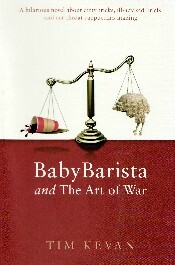 If I had any doubts about how the Baby Barista column might stand up as a book (especially as I have read it already) they are entirely dispelled by Baby Barista & the Art of War (which you can also buy from Amazon . The whole is most definitely greater than the sum of its parts and it’s lovely to have it all in one place so you don’t have that feeling you have missed an episode. It’s just as witty on re-reading. And just as much fun trying to match the characters to real life barristers (& please don’t tell me who I remind you of & I will return the courtesy!). But, of course, none of it could be true could it? “..we start off in this job with so much potential. The world is our oyster and we can do anything we choose. We then spend years taking ourselves further and further away from the mainstream until we are so specialised that if we were to jump ship there would not even be a life-raft nearby. We are good only for being barristers. Otherwise it’s straight back down to the bottom of the pile aged forty-four”. Substitute ‘family lawyer’ for ‘barrister’ and it sums up many of the conversations I have been having with family practitioners in recent months. Fortunately, these are atypically bleak moments in an otherwise hugely enjoyable debunking of the world of the Bar. But is Baby Barista really as Machiavellian as he is made out to be? Most of his victims are odious and richly deserve what they get. He has far too soft a spot for OldRuin whose life he saves, returning a brief to do so & upsetting his HeadClerk (is he mad?). He loves his mother despite her embarrassing appearance at the chambers’ tea party bearing cake. Part of his drive to succeed in the tenancy stakes is the desire to keep her from hookey street. And then there is the fragrant Claire for whom he is clearly destined so long as she doesn’t find out the full extent of his shenanigans. If there is a moral to this amoral story perhaps it is that inside every barrister is a nice person trying to get out?